This May Microsoft released their own free game creator, Popfly Game Creator, as part of their Popfly social networking effort. The current version is limited to two-dimensional, online games only and requires Microsoft Silverlight and a Microsoft Passport account. At first try, it appears that the kit is very, very easy to use, with the result (as usual) being that the games all tend seem like the kits they came from. 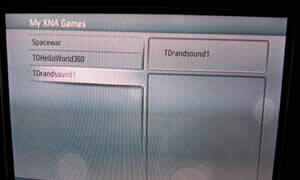 In fact, you can select a game type (I tried Fire Cars) and it will play right then with no more modifications. The only reason this has a chance of success is that Microsoft, with all its manpower, has created an extensive assortment of drop-in characters, scenes, games, sounds, you name it. Note: Although this is entirely plausible, it was in fact an April Fools ‘joke’. This one was designed to be more convincing than funny. A year ago I’m sure most readers would have thought it ridiculous, but nowadays it’s only a matter of time before a ‘GMConsole’-like project exists. In fact YoYo Games is working on such a project as we speak. A GMC user named noodle-gawk has been diligently working on an astounding project for the past few months called ‘GMConsole’. As the name suggests, it is an effort to get Game Maker games running on as many game consoles and computer platforms as possible. For years the question has been asked on the GMC, “Can my game run on a PlayStation?”, “How do I put my game on an Xbox”, “Is there way to run GM games on my DS?”; and until now these questions have been treated by other users as ‘noobish’ (in other words, very silly and absolutely outrageous). However that is all about to change. Apparently the user has been working independently of YoYo Games to create his own ‘virtual machine’ written in C++ to interpret GML coding during runtime and translate it to commands the platform running the game can execute. In addition to this, an API released by ATI has offered a way for noodle-gawk to easily convert DirectX commands into OpenGL commands when needed. This has allowed the games to run on Macintosh computers, and (slightly less stable) on Linux machines. As for consoles, noodle-gawk has been working with the director of XNA Game Studio Express, Dave Mitchell, to develop a conversion method of GM games to XNA’s project file format. With a little luck and making good use of the C++ runtime component, GM games should be able to run on Xbox 360. (The conversion at this point is not that easy, and there is a large limitation to what functions can be used, for now). Although Sony doesn’t provide an official SDK for amateur developers that noodle-gawk can distribute, he plans on using one of the many third party development packages available on the Internet. The problem is these packages are likely to only work with ‘modded’ or ‘hacked’ consoles. At this point, PlayStation support is still in the research stage, but looks somewhat promising. Wii is turning out to be a tough console to work with, although noodle-gawk is confident that he will be able to get GM games (at least simple or modified ones at first) on to the console given enough time. He plans to use what is known as the Wii Opera SDK. This means the games will essentially have to be re-written/converted to Java (which Nintendo says will be supported in the next version of Wii Opera) and run on the Wii’s built-in web browser. He plans to team up with the G-Java team which is already working on a similar project. If this project becomes a success, it should also open up opportunities for more devices like mobile phones, and also embedding games natively inside the web browser. 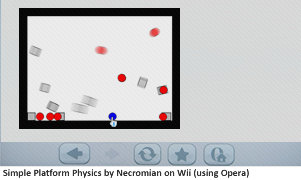 Here is a screenshot of a GM example running on Wii’s beta web browser (to be released publicly in the next month or so). In addition to consoles and operating systems, noodle-gawk has also managed to interface with the new iPhone SDK, and it looks like this will be the most promising to port GM games over to. YoYo Games also recently announced their interest in the iphone SDK, and there may be some competition to see who can deliver a conversion utility first. Although the project is far from done, it is pretty amazing what noodle-gawk has been able to achieve thus far. Too bad it’s AF today. For more information on the project, feel free to contact noodle-gawk here. He hopes to get a site up and running with working demos soon.